A brand new Korean grab & go concept restaurant – exemplifies how traditional Korean cuisine is revitalized by modern ideas. A Display and Retail Fixtures Creative co. newly revamped its website. A brand new Korean Restaurant Group’s website launched. A brand new PULSAR Watches New website launched. A brand new look LORUS Watches’ website, a part of the world famous SEIKO Watch Corporation, launched. A new “Clean Air Network” website – OUR AIR, OUR HEALTH, is launched, come visit us and join the movement! Aprikos is pleased to announce the launch its company website! 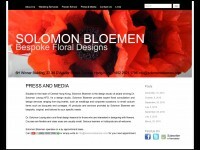 We are pleased to launch a floral design studio website owned by award winning floral designer Dr. Solomon Leong.